I find myself in difficulties when writing about recordings which are so very good, it is hard to find a balance which describes a believeable truth as I hear it, without making a text which just ends up turning into sycophantic hyperbole. Looking on the Celestial Harmonies website, at least I am supported by the artist himself, who “considers [this] possibly the best recording of his career”. Even on only a first hearing, taking the music and performance in by osmosis while engaged in another little sideline of translating Dutch into English, the magic of this recording soon established itself. Having heard many of these pieces live and at times being rehearsed frequently, and having examined and worked with them in detail while making arrangements, I do feel a close affinity with this music, even though it will always be way beyond my meagre abilities at the keyboard. 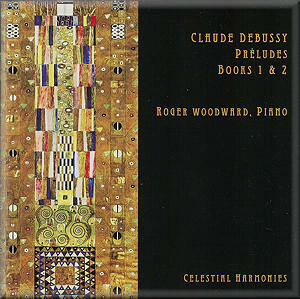 Roger Woodward’s first complete recording of both books of the Préludes by Claude Debussy was made after a highly successful concert at the Chamber Music Hall of Radio Bremen. He clearly felt at home in the location, and one with the Bösendorfer piano used, the instrument having been restored by a factory technician, and tuned and engineered to perfection. The recording brings out the warmth and sustaining power in the piano, which has a notably different sonority to the more bright and brilliant shine of a Steinway. Just listen to the low final notes of the opening Danseuses de Delphes and you will hear where the foundation of the sound sits in the soundboard, the strings encouraging an almost endless field of colour for Debussy’s harmonies. My own reference in terms of recordings has for a long time been that of Cécile Ousset on her 1986 EMI two disc set 7 47608 8 which is now long out of print, though she does have a recording available on Berlin Classics label. I also lived with Claudio Arrau on Philips for a long time, which is another beautiful set. I found it made me depressed for some reason, in the same way as rainy afternoons when there are no CDs to review. Roger Woodward does not make me feel in any way sad and soulful though his playing – on the contrary, his performances are life affirming, a spiritual journey indeed and one which at times may move you to tears, but one which ultimately lifts one beyond the clouds. Even his Des pas sur la neige have a ‘Scotch snap’ feel to that rhythmic feature of the main theme, something given a certain broad expressive licence by many pianists. In this case it might illustrate someone picking their way over thin ice rather than leaving a trail in deep snow. The massive tumult of the following piece, Ce qu’a vu le vent d’ouest, is a remarkably powerful statement in Woodward’s hands, and one can hear where Messiaen would have picked up on such a wild image of nature in music. Contrast, rich imagery and drama are all composed into these Préludes, but Roger Woodward breathes life into the notes at every turn. The sonorities of the Bösendorfer suits La cathédral engloutie particularly well. Just listen to the notes from about 00:40 in: the most evocative distant bells I think I’ve ever heard in a recording. The build-up to the great bass chime at 2:38 is a truly cathartic moment, and the whole experience is a remarkable monument to Debussy’s pictorial imagination and modernist thinking. Woodward takes 7:22 here compared to Ousset’s 5:46 but the difference is no indulgence, the sustaining power of the Bösendorfer strings making a lengthier exploration of this music all the more powerful. Woodward’s timings are by no means excessive in general, and he frequently comes in under Ousset’s durations in the lighter pieces. What Woodward is prepared to do is allow Debussy’s curtains of sound full expression with his pedalling in something like Brouillards which begins Book II of the Préludes. His clarity is faultless to my mind, but washes of sound are allowed to grow and swirl like the spread of watercolours over damp paper. The mysterious dance rhythms which grow out of the music here and there are also particularly piquant in these performances. The Habanera of La puerta del viño works on us like an echo from a lost and distant past, a sound to which ghosts may dance, but which mortals may only witness through sidelong glimpses around the corners of the Alhambra Palace, and a deeply felt awareness of its past peoples. This seriousness of purpose does carry through to the cakewalk of Général Lavine – eccentric, whose asymmetrical gait carries a ruminating frown despite plenty of bounce in the rhythms, and whose quasi-pomposity raises a wry grin rather than a belly laugh. The humour of Pickwick is also pretty much subsumed in marvellous and colourful pianism, though the spirit of fun in this music has perhaps always had a Gallic way of escaping me. Without wanting to gloss over the marvels to be found in all of these Préludes, I’ll just mention the fireworks of Feux d’Artifice. I hope Roger Woodward’s fingernails didn’t suffer any painful damage, but you can hear them rattle hard against the keys on the downward glissando at 00:25. This performance has everything: those washes of colour, and the sharp contrast of clarity in those notes which rise and sparkle through those improbably rich textures, those harmonic progressions pushed strongly by that chunky Bösendorfer resonance. A favourite of my mate and accompanist Johan the piano, I’ve heard this piece on innumerable different instruments and in more than one hemisphere, but I’ve never heard it in as spectacularly a breathtaking performance as this. One of an increasing number of recordings of the complete Préludes on a single CD, this disc is not only terrific value in terms of its timing, but also the best performance I have ever heard. There is competition of course. Pascal Rogé on the Onyx label is a single-disc release and has to be a contender, and Steven Osborne on Hyperion also provides good value. Krystian Zimerman comes in at an even more improbable 84:00 on his single Deutsche Grammophon CD. I’m happy to stick with Roger Woodward though. This recording has been something of a revelation for me, crammed full with new discoveries in the potential of these pieces and of the piano as an implement for pure musical expression. I’m left lacking superlatives, and can only urge you to try this recording for yourself.